Each year, the Sake Samurai Association selects a number of men and women who have shown dedication to the promotion of the tradition and culture of sake to be inaugurated as Sake Samurai. 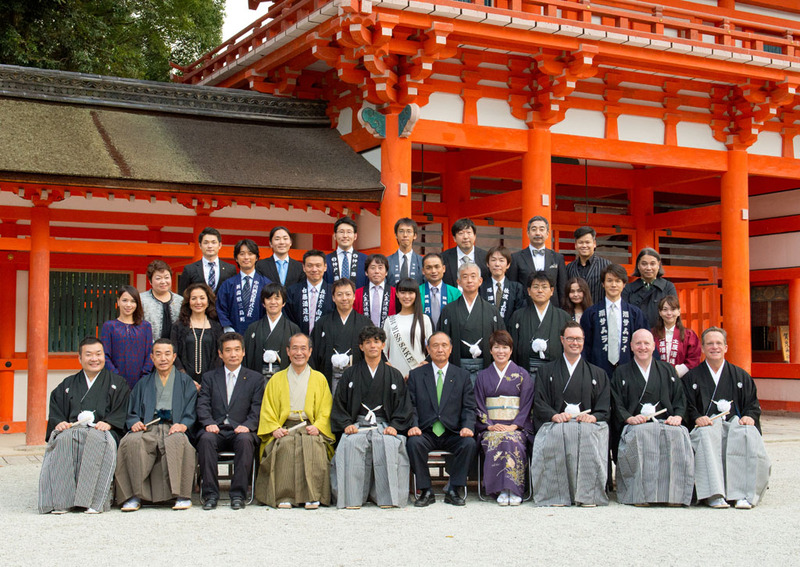 These committed sake communicators are chosen from candidates living and working in all parts of the world, and in many different fields. The line-up this year is as impressive as ever, highlighting just how much interest and awareness in sake continues to grow, thanks in no small part to the tireless efforts of the Sake Samurai community. On January 15, 2013, the Kyoto City Assembly unanimously passed an ordinance intended to promote sake produced in Kyoto—requiring that when “kampai” be said it must be said with sake. The intention is to promote the tradition of toasting with sake throughout and beyond Japan, as well as the traditional brewing industry of Kyoto and the traditional culture and cuisine of the city. Both men were key in formulating the ordinance. Once the ordinance was passed, many other cities in Japan followed the example of Kyoto in passing similar ordinances. Hisao has been Head Chef at Miyamaso, a ryokan owned by his family and specialising in tsugami-gusa (freshly-picked) cuisine, for 27 years. He has also spent time working at the Tokyo branch of Hyotei, a restaurant established around 400 years ago. In April 1997, he opened Sojiki Nakahigashi, a restaurant specialising in cuisine made from wild plants and vegetables, in Kyoto. For Hisao, each day begins with a search for fresh wild ingredients in local fields and countryside. He then creates dishes that reflect the natural world as he experiences it anew with each passing day, as well as the changes of the season. He has been central in communicating to many chefs in the Kansai area the potential of wild vegetables and herbs, and he has also been a strong supporter of local agriculture. Hisao is also a dedicated lover of sake. Throughout all of his activities, Hisao always manages to convey the beauty and the brilliance of Japan and its culture. Etsuko is a pioneering figure in the development of inbound sake brewery tourism. She set out her mission in 2009—to establish sake brewery tourism in Japan and through this to expand the markets for Japanese sake and food overseas and for inbound tourism—and began to operate sake brewery tours for overseas tourists. She is also involved in setting up tasting events in the US as part of the promotional activities for her tours. Her tours have prompted considerable media coverage for both sake and sake brewery tourism, and indeed the promotion of sake is the driving force in the majority of her activities. Etsuko is also a qualified English-Japanese interpreter, a qualification she determined to obtain in order to further contribute to the sake industry in Japan. Today, she coordinates and interprets for groups of tourists and food and drink industry professionals in Kyoto as well as other parts of Japan, with a particular focus on visiting sake breweries. Etsuko has been involved in organising tasting events at the Australian Embassy in Tokyo, for Tokyo-based diplomats, and for non-Japanese residents. She also established the Tokyo Sake Meetup in 2007, where people interested in sake get together to talk in English and enjoy sake. Soji is the owner of one of the most successful restaurant chains in Taiwan. He was born in Tokyo in 1974, to a Japanese father and Taiwanese mother. He lived in Japan until he graduated from high school, after which he moved to Taiwan to attend university. While still a student, he opened his first yakiniku (barbeque meat) restaurant, and since then has produced and run a series of restaurants, focusing on Japanese cuisine. He is dedicated to becoming a bridge between Japan and Taiwan, and is relentless in educating his restaurant staff in the Japanese style of hospitality and customer service. He is also involved in strengthening the bond between Taiwan and Japan in other ways, working as an occasional film producer and organising Japanese festivals in Taiwan. He has now founded an educational institute for sake in Taiwan, the Kampai Sake School, through which he intends to promote further interest and awareness in sake by enlisting the help of sake businesses, sommeliers and importers based in Taiwan. Andre is the owner of five restaurants and bars in the Melbourne area, including Izakaya Chuji, Golden Monkey and Robot. In 2007, Golden Monkey was named Australia’s New Bar of the Year by Bartender Magazine, and subsequently won Best Bar in Australia for two years running. In 2008, he opened the first bar in Australia ever to specialise in Japanese beverages, Bar Nishonshu. In 2011, he opened Izakaya and Sake Bar Kumo, which boasts the most extensive sake list of any bar in Australia. The establishment was later rewarded, in 2002, with the grand prize at Australia’s Wine List of the Year Awards 2012, operated by Gourmet Traveller Australia. He is well known throughout Australia as an expert in Japanese culture and cuisine, and since 2010 has held an annual sake tasting event at the Melbourne International Food & Wine Festival. These events inevitably sell out, a testament to the popularity of both sake and Andre himself. Aside from his restaurant work, Andre also regularly writes for various media outlets in his guise as “The Sake Master”, appears on television in both Japan and Australia, and is also a regular speaker at seminars and events. All of these activities serve to promote Japanese cuisine, sake and culture throughout Australia, forging an important bridge between the two countries. Andre is also currently the only Australian national to hold Level 2 Sake Professional Certification awarded by the Sake Education Council in Tokyo. He regularly travels to Japan and has visited many sake breweries to improve his understanding of sake and its production. Chris first encountered sake around 20 years ago, when he travelled to Japan to work as an English language teacher. He was captivated by the culture and history of sake, and continued to learn about the drink on his return to the US by working in restaurants in the US. He built up considerable experience in some of the best known restaurants in the US, including Bond Street, and in 2002 opened his first establishment, a Vietnamese restaurant. Here, he served Vietnamese cuisine with Japanese sake, a combination that proved to be a great hit. Chris is determined to push sake up to the level at which wine and cocktails are enjoyed worldwide. His activities are focused on his desire to see greater understanding of sake, so that it is not simply seen as a traditional drink to go with traditional Japanese food, but as a versatile drink that pairs just as well with Western and other Asian cuisines and as an on-trend drink that can be widely enjoyed. Chris is an SSI-qualified sake sommelier, works as a senior judge for the US National Sake Appraisal, and is also on the executive committee for Joy of Sake. In 1999, he came third in the first World Kikisake-shi (Sake Sommelier) Competition, beating off considerable Japanese competition. He was then invited to be a judge at the second competition. Chris is a regular visitor to Japan, and has spent time studying the outstanding techniques of many master brewers during his trips to breweries. He has recently taken a position as Sake Sommelier and Consultant at Cherry, a restaurant in New York, which boasts an incredible line-up of 77 sake. He is also involved in educational activities outside of the US, while in the US he regularly appears in leading magazines and wine media as a sake expert. The import and wholesale company Sidney Frank Importing Co., Inc. holds a unique place in the sake industry in the US. It was this pioneering business which was responsible for identifying outstanding sake brands overseas and establishing the sales routes and marketing frameworks required to introduce those brands to the US. John has a strong wholesale network throughout all 50 US states, including with the country’s largest drinks wholesale company, Southern Wine and Spirits. Sidney Frank Importing was set up 41 years ago, in 1972, at a time when there was very little awareness of Japanese sake in the US. Eugene Frank, the founder of the company, piled bottles of sake into a handcart and pushed it around Manhattan, visiting restaurants and bars to introduce them to this new drink. Gradually, together with his four staff, Eugene began to establish firm sales channels. John Frank is the eldest son of founder Eugene, and joined the company in 1979. Since then, he has built up formidable product knowledge, market awareness, and organisational and leadership skills. He is a pioneering figure who has been key to the expansion of the Japanese sake market in the US through the application of the latest marketing theories and techniques. Today, around 100 sales staff work under John’s direction to try and heighten awareness and interest in sake in the US, by conducting seminars and tastings across the entire 50 states.